monument valley, september 1995 - If you like 'Western' movies, you'll surely know the landscapes of Monument Valley NP in Arizona. Most of these movies were filmed over here, and you can even visit some movie set 'ghost towns' in the area. 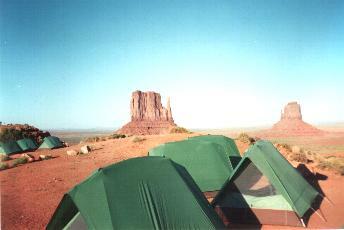 It's a great experience to camp in this desert of red rocks, buttes and mesas. 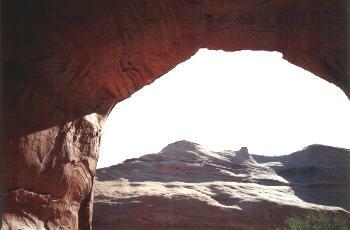 This is Navajo land. 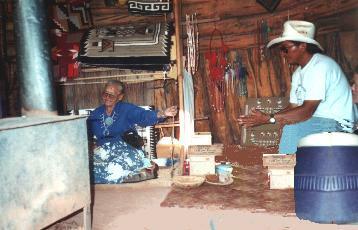 The Navajo native Americans still live on this land. While most of them have a way of live like most of us - that is, they wear western clothes and have a 'regular' job - they still try to preserve the culture of their ancesters. Before sunrise. We had an appointment with Tony, our native jeep driver, which would guide us for the day into Monument Valley, show us the land he loved so much , and much more... The first destination was a viewpoint, where according to Tony, the sunrise was the most beautiful. We drove into the dark on the jeep tracks - I wondered all the time how he knew which way to go, because most of the (moonlit) views appeared similar to me. The place was called the 'Totempole' - as all rocks had a name for him, a lot of names were invented just for the tourists, the Navajo had their own names. Sunrise was soon there, and the view of the rising sun next to the 'totempole' was indeed spectacular. Minutes later it was full daylight, and another hot day had started. Tony took us to many other places, like 'artist view' (the most used view in paintings, photographs, and in movies), the 'moccasin arch', and numerous others from which I forgot the names. He also showed us several plants growing in the desert and pointed out animal tracks. Next thing to do was to hike to the top of a mesa. Like real spidermen and -women, we used the rope net - Tony didn't need this, he attached the net for us. On top, the sight was like that of a moonlandscape. It was getting hot already; Tony learned us how to use 'natural cooling' by laying down on your back onto the rock. Later we were back on the road and drove into the arches landscape. We stopped by a kind of a cave. Tony now played on a little drum (made of the oil filter of a truck and animal skin) and sung a traditional song. He learned us how to dance like the natives and we all tried this together. It was a nice moment of the trip. To finish the jeep tour, he took us to a traditional hogan, where we could see a woman spinning wool. 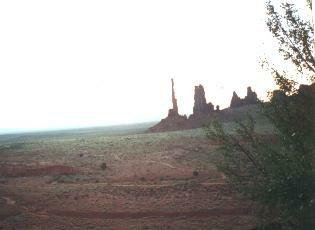 Another day in Monument Valley, we all went to go horseback riding. This was the typical 'tourist thing' to do, and the horses were very tame. I had never been on a horse before, but this was really easy : the horse just followed the path it knew very well. I guess this was not at all typical for the 'real wild west' , as we knew from the movies... It is true that mass tourism over here spoiled the real experience, but what I remember the most were the evenings on the camping site. Camping between the buttes and mesas is really spectacular, and at sunset I watched for hours the ever changing colours of the rocks.